Unlike diagnosing many cancers, early detection screening has not been available until recently with low-dose computer tomography (LDCT). Smokers, former smokers and long term asbestos exposed workers are perfect, once a year candidates, for this breakthrough screening technology. 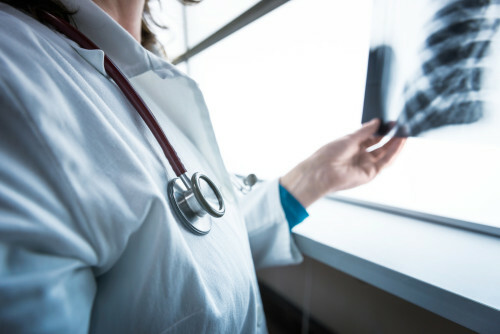 Clinicians believe that chest x-rays are not considered reliable for early detection of lung cancer tumors when they are at their small size and earliest stages. Stage I & Stage II type cancers are usually treated by surgically removing the tumor. Most commonly used surgery is called VATS (video-assisted thoracoscopic surgery) utilizing a small incision in the chest wall to remove the tumor. Adjuvant chemotherapy therapy (chemotherapy after surgery) is usually prescribed to help prevent the cancer from reappearing in non-small cell, Stage I, II and IIIA cancers. Stage IIIB non-small cell cancer tumors that cannot be surgically removed, chemotherapy and radiation is often prescribed. Stage IV non-small cell cancer, chemotherapy is used with radiation therapy used only as a palliative (pain and symptom) treatment. Second Line Chemotherapy is a second dose therapy prescribed if the cancer reappears. Neoadjuvant Treatments are chemotherapies prescribed before surgery or radiation to try and shrink the size of the tumor to make it easier to remove surgically. Targeted Treatments are newly developed targeted drugs that unlike chemotherapy, that attacks all cells, health and cancerous, targeted drugs attack only the cancer cells that have what is called, biomarkers. This therapy is mostly used in patients with advanced forms of lung cancer. According to Cancer Centers of America, immunotherapy is a broad category of anti-cancer therapies that use the body’s immune system to fight cancer cells. Immunotherapy drugs are designed to alert the immune system about these mutated cells so it can locate and destroy them. The immune system is always ridding the body of foreign invaders, such as viruses, bacteria or fungi. Lymph nodes, which make up most of the immune system throughout the body create white blood cells, such as “T cells,” to fight infection and cancer. Mesothelioma cancer cells are not recognized by the body’s immune system because these cells are part of the body’s own cells. These cancer cells are like lung cells that no longer act like healthy lung cells, allowing these dangerous cells to grow, divide and spread throughout the body. One way cancerous cells stay hidden is through the PD-1 receptor, which tricks the body into thinking cancer cells are normal. Certain immunotherapy drugs work by blocking this evasive maneuver with a PD-1 inhibitor, which quiets the PD-1 receptor, allowing the cancer cells to be exposed as invaders, and triggering the immune system to send out an alert and launch a system-wide attack. Stage I (limited stage) cancer usually requires both chemotherapy and radiation therapy applied simultaneously, to help slow the spread of this rapidly accelerated disease. Stage II (extensive stage) cancer utilizes chemotherapy by itself. Prophylactic Cranial Irradiation (PCI) is radiation therapy used to prevent the cancer from spreading to the brain due to the fact that over 50% of Small Cell Lung Cancer victims experience tumors in the brain. Non-Small Cell Lung Cancer and Small Cell Lung Cancer may be caused by asbestos exposure. Medical research has shown that workers exposed to asbestos get more than their fair share of lung cancers, which are assumed to result from inhaling the asbestos fibers over a long period of time. Most asbestos-related lung cancer starts in the lining of the bronchi, the tubes into which the trachea—or windpipe—divides. Asbestos lung cancer may also begin in the trachea, bronchioles, or alveoli. The treatment for lung cancer depends on many factors, including types and stages of, the patient’s health and the size, location, and extent of the tumor(s). Treatment options include surgery, radiation, chemotherapy and other options previously discussed. Most lung cancer usually develop slowly, but it frequently spreads to other parts of the body in its advanced stages. Consequently, it is often diagnosed late, when medical measures are relatively ineffective. As attorneys representing lung cancer patients and asbestos exposed victims of lung cancer we offer this medical information for informative purposes only. We make no medical recommendations and the information represented here is our best attempt to explain lung cancer, with the best medical terminology available so that our clients and potential clients are better informed about these diseases.